With the weak economy and sluggish housing market, the leaders of concrete products businesses feel stuck, frustrated and frozen in place. We know that maintaining a strategy of downsizing, economizing and streamlining will not lead to long-term success. We need growth. But, how can we get more sales and find new opportunities, especially with demand from our customers remaining so weak? As owners and leaders of concrete businesses, we need to get out of our offices and personally conduct three days of field research to better understand our businesses and the marketplace and to see our companies through the eyes of our customers. Day One: Make the rounds with your best salesperson and observe him in action. Why is she so good at what she does? How can you take some of that “magic” and impart it to your other staff? What does he think is most important in re-kindling growth? How does she really sell your products and services? What is limiting him from selling even more? What is really important to the current and potential customers that you meet? Day Two: Meet with one of your best customers and thank them for their business. A good customer will feel appreciated, even flattered. In the conversation, you will also learn about the customer’s strategies and challenges. The customer will likely tell you where your company needs to improve and how you stand relative to your competition. The customer may also suggest new product and service possibilities. And you may even jointly brainstorm about innovative solutions to this customer’s problems. In the end, you will be much better prepared to serve this customer’s changing needs. You may even be able to team together to develop product enhancements or new products and services, tying you in even more closely with this customer. Day Three: Go through your quote log and order book in detail and learn about your newest customers as well as those prospects you have quoted for the first time. Why did these customers reach out to you now? Are they in an industry or market that is growing and may be a sales opportunity in the future? Are they using your products and services in new and different ways? For those customers that you quoted to and lost, can you change your product and service offerings to better satisfy their needs? After three days of personal field research, you will have a much better idea of possible strategies—some of which may have been right under your nose all this time—that will move your company back onto a path for growth, even in these sluggish times. So, what are the nine keys to driving cultural change? 1. Clear definition: Define the new culture clearly, fully explaining its attributes and acceptable behavior in it. 2. Over-Communicate: Through training, communicate your picture of the new culture and the required change in values and goals. Communicate repeatedly. Each time you speak about the new culture, some team member will likely be hearing and understanding it for the first time. 3. Leadership Example: As the leader, embody the new culture in your actions, words, and behaviors. Anything less will be perceived as hypocrisy and a lack of commitment to the change. If you want to create an improved customer service mindset, then be customer-oriented and -focused yourself. 4. Relentless Follow-up: Continue with ongoing follow-up, support and encouragement. Start meetings discussing the progress toward the new culture. When managing by walking around, ask employees about their understanding of the new culture and what it means. 5. Create Conditions to Align with Culture: Change the physical environment to reflect and allow for the acceptance of the new culture. If teamwork is the theme, re-arrange the office and plant to induce better teamwork. If safety is the theme, spend the money to make the physical conditions in the office, plant or with delivery vehicles safe. Likewise, align the incentives to match the goals. 6. Share Good and Bad Examples: Share the success stories about individuals or teams that have embraced the new culture. Also, share the failures; describe the times when you or others did not live up to the new values and goals. 7. Involve the Individual: Involve the employees, encouraging their new ideas and putting them into practice. When appropriate, have individual employees teach or evaluate each other. Any involvement of the individual employee in the cultural change gives them a stake in realizing it. 8. Accountability: There needs to be accountability. Expel those employees who do not accept the new culture. Since they do no longer fit in with the new culture, they will just be an impediment to its full implementation. 9. Patience and Persistence: Changing the culture involves changing the mindset and instincts of each person in the company. This does not happen overnight. So, patience and persistence is required to continue down the path for the one to three years usually required. David M. Shedd heads Winning B2B Leadership, an advisory firm serving small to middle-market companies in the concrete products and other manufacturing industries. His experience includes 10-plus years in executive positions with a major precast concrete producer. He is the author of Build a Better B2B Business and maintains a blog at www.helpingleaderswin.com. He can be reached by e-mail at [email protected], or by phone at 480/734-0569. 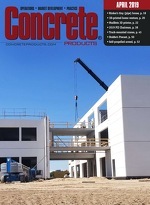 This is the first in a series of columns addressing leadership and business success for the concrete products executive.